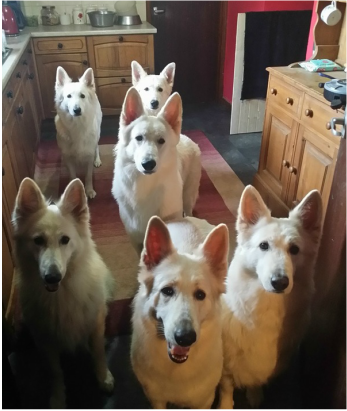 We are owned by three male and four female White Swiss Shepherds and they all live in our home with us as part of our family. We live on a remote smallholding in Pembrokeshire near the Preseli Mountains in Wales but we also own a home with an acre of land in the beautiful Valencia region of Spain where we occasionally spend some time with our dogs. 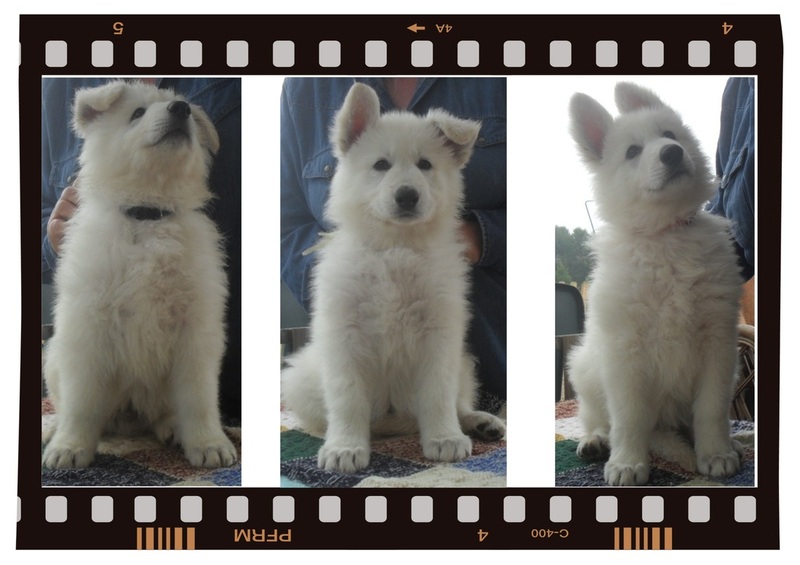 Our White Swiss Shepherds called Asha, Justice, Chai, Cova, J.C. , Chase and Fallon are first and foremostly our pets but they have all been regularly shown in and around Europe. The UK Kennel Club recognised the White Swiss Shepherd in October 2017. Our Fallon and Chase are the only two of our dogs currently being shown in the UK due to our oldies being in retirement. Before UK breed recognition, between 2008 and 2017 in the show ring our dogs and their offspring have been awarded over 80 championship Certificates between them under many top International Judges from around the world - we are so proud of all our gang! Some of our dogs offspring are also proving themselves in show rings around Europe (at all levels) having been awarded Best in Show, Group 1 wins, numerous CAC/CACIB's, Best Puppy placings, Best Junior & Best of Breed and some have Champion titles. Our goal as dedicated WSSD show and occasional hobby breeders has been to produce the best examples of the breed as to our ability having kept quality above quantity in mind. We always have aimed for our 'Sereno Spirit' offspring to be considered as close as is possible to their Breed Standard in all aspects. We are NOT commercial breeders and only have the occasional litter. Producing healthy, future family companions with good character and temperament is high on our agenda. White Swiss Shepherds in Ireland four years running! Top Breeder award is given to a breeder who's dogs offspring have won the most awards in the show ring throughout the year.